A combination of disappointing guidance and increasing competition has resulted in a painful 2016 for Myriad Genetics investors, but there are reasons for optimism. It's been a rough year for molecular-diagnostics company Myriad Genetics (NASDAQ:MYGN), which has seen its stock plummet 26% year to date, wiping out the 25% it gained in 2015. The decline is confusing to many, given that the company recently launched long-awaited diagnostic tests that are performing well so far and appear poised to drive long-term growth for the company. For investors wondering what the deal is, it seems that two factors -- disappointing guidance and increased competition from comparatively tiny Invitae (NYSE:NVTA) -- are behind the stock's 26% drop this year. While Wall Street may be right to worry, there are also reasons for long-term optimism. As the following chart demonstrates, Myriad Genetics stock is no stranger to volatility. Many sharp inflection points have punctuated a generally negative trend this year, highlighting Wall Street analysts' knee-jerk reactions. Two of the largest daily declines have come in February and May, after the company reported quarterly earnings for its fiscal second and third quarters, respectively. However, total revenue and EPS increased in both periods compared to the year-ago periods. Importantly, revenue for Myriad Genetics' two newest diagnostic tools, Vectra DA and Prolaris, grew at healthy clips. Vectra DA is a blood test used to determine the risks of future joint pain in patients with rheumatoid arthritis -- the same disease treated by AbbVie's Humira, the best-selling drug in the world. In other words, there's a large market and enormous growth potential. Vectra DA has delivered $35 million in revenue during the first nine months of the company's current fiscal year, representing 10% growth compared with 2015. Prolaris uses a novel scoring system to determine the severity of prostate cancer tumors and help physicians determine appropriate treatment. It provides another solid growth opportunity for investors, and though its new to the market, Prolaris has delivered since its launch. The test generated $7.1 million in revenue in the previous two quarters, compared with just $900,000 in the year-ago period. Vectra DA and Prolaris represent important products in the quest to diversify revenue away from the company's BRACAnalysis tool, which determines risk factors for breast and ovarian cancer, and which generates the bulk of the company's revenue. But these new products are still small potatoes, having combined for $42 million in revenue in the current fiscal year. All other tests have generated roughly $490 million in the same period. Despite the encouraging performance of Vectra DA and Prolaris, Wall Street remains fixated on guidance, which has recently disappointed -- well, it has disappointed models made by Wall Street, anyway. Myriad Genetics has guided for revenue between $186 million and $188 million for the final quarter of its fiscal year, but Wall Street was looking for close to $190 million, according to estimates from Yahoo! The company's EPS guidance, in the range of $0.36 to $0.38, represented the low end of Wall Street expectations. 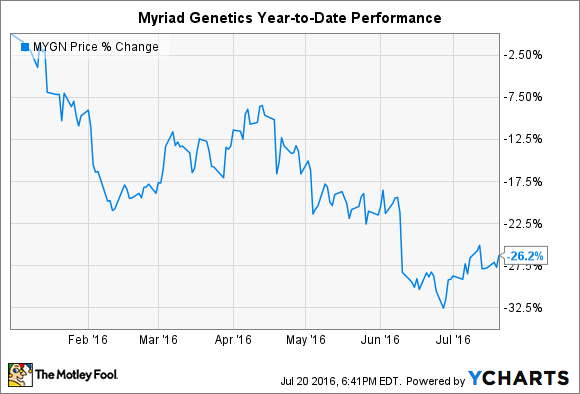 Of course, even at the low end of guidance, Myriad Genetics is poised to top its 2015 performance. More important for investors and Wall Street is the increased competition with the company's flagship product, BRACAnalysis. Invitae has a market cap about one-tenth that of Myriad Genetics, but it has a disruptive business model that makes it easier and cheaper for physicians to order diagnostic tests. In April, the Medicare contractor that sets pricing for both companies' tools listed Invitae's BRCA diagnostic tool for $622.53 -- representing 28% the price of BRACAnalysis. It's too early to predict an existential crisis for Myriad Genetics, but investors seem to be pricing in the inevitability of reduced prices, and therefore reduced revenue, from the top money-maker in the product lineup. Slowing revenue growth and disruption in its biggest market are major headwinds facing Myriad Genetics, but there are reasons for optimism in the long run. The company has two tests growing at healthy clips that could, in several years, insulate against falling revenue from BRACAnalysis. Additionally, this year the company has expanded strategic research collaborations with AbbVie (lung cancer) and the duo of Merck and Tesaro (breast cancer and ovarian cancer). Both collaborations are aimed at providing diagnostic tools for late-stage clinical therapies, including promising anti-PD-1 antibodies that are being tested in several cancer types. These are hardly the only molecular diagnostic tests in the pipeline, and success isn't guaranteed, but it highlights the fact that the company isn't as stale as the headlines might have you believe.